In honor of the 50th anniversary of one of America's most beloved Christmas specials, name the following related to A Charlie Brown Christmas. 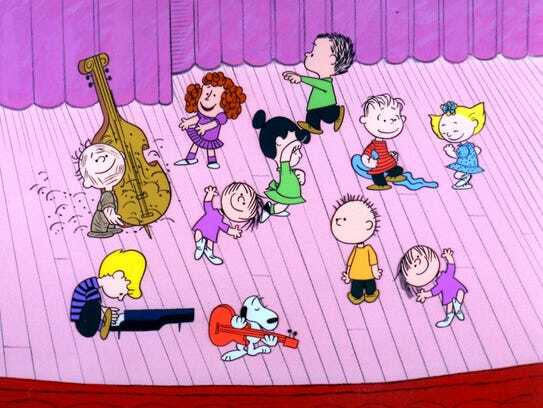 Who created the jazz score for the special, including the now famous "Linus and Lucy" for the dance sequence? When Charlie Brown visits Lucy's psychiatrist booth, she eventually diagnoses him with pantophobia, which is the fear of what? After Lucy convinces Charlie Brown to direct the Christmas pageant, she tries to console him by telling him that she too gets depressed around this time of year because no one ever gets her what she really wants. What does Lucy really want for Christmas? Charlie Brown tries to explain his directorial style to his cast. Name any one of the four motions he makes AND what that motion means he wants the cast to do. point to the right/focus attention stage right, slashing motion across throat/cut the scene short, revolving motion with hand/pick up the tempo, spread hands apart/slow down. Name EITHER of the green clad characters seen in this still of the dance sequence? What role does Lucy suggest she should have in the pageant, despite the fact that it likely did not appear in a script regarding the Nativity? In Lucy's estimation, Christmas is just a big commercial racket, run by what? "I think it needs me." Schroder is enraged by Lucy's argument that Beethoven wasn't so great. Lucy's counterpoint is that Beethoven can't be great because he did not appear on what? Charlie Brown's humiliation and anger upon returning with the scrawny tree subsides after Linus explains the true meaning of Christmas by reciting the King James version of the annunciation to the shepherds scene from chapter 2, verses 8 through 14 of which Gospel? Which 1739 Christmas carol, penned by Charles Wesley, is sung by the entire cast as the credits roll?